Singaporean giant keen to become strategic investor in Vietnamese mobile phone provider. Singaporean telecommunications giant Singtel has expressed an intention of securing a stake in mobile phone provider MobiFone during its equitization process. Mr. Oliver Foo, Vice President of Business Development and the Center of Excellence Program Office at Singtel, spoke of its intentions at a meeting with Deputy Minister of Information and Communication Pham Hong Hai on August 19, according to the Ministry of Information and Communications (MIC)’s news portal, and said it hopes to become MobiFone’s strategic partner. The ministry appreciated the entry of foreign investors into Vietnam’s telecommunications sector. “Singtel should hold discussions with MobiFone first to understand the equitization process and then submit a proposal to MIC,” Deputy Minister Hai told Mr. Foo. He added that if MobiFone does not conduct its equitization by the end of this year it will have to be re-valued. “This is because its current valuation, conducted in June 2015, is only valid for 18 months,” he explained. MobiFone was valued by VietCapital Securities, founded and owned by Ms. Nguyen Thanh Phuong, the daughter of former Prime Minister Nguyen Tan Dung, after MIC rejected a valuation bid by Switzerland’s Credit Suisse due to its high cost. “We met with Credit Suisse but their price was too high, so we decided to select VietCapital Securities,” Mr. Le Nam Tra, MobiFone’s Chairman, was quoted by ITC News as saying at the time. If Mobifone is re-valued, “it will take six months,” according to Mr. Hai. Singtel is Asia's leading communications group, providing a diverse range of services including fixed, mobile, data, internet, TV, information and communications technology (ICT) and digital solutions. Headquartered in Singapore, it has more than 130 years of experience and has played a pivotal role in the country’s development as a major communications hub. It has strategically invested in leading companies in Asia and Africa, including Bharti Airtel (India, South Asia and Africa), Telkomsel (Indonesia), Globe Telecom (the Philippines) and Advanced Info Service (Thailand). MobiFone is one of three largest telecommunication companies in Vietnam and is the first of the three to be equitized. Deputy Prime Minister Truong Hoa Binh officially decided in early August to conduct a comprehensive inspection into a deal in which MobiFone purchased 95 per cent of the Audio Visual Global JSC (AVG). He assigned the Government Inspectorate to work with relevant agencies to conduct the inspection, with sanctions available under law to be applied if any legal violations are uncovered. Vietnam’s second largest mobile network operator announced the purchase of 95 per cent of AVG on January 1. Deputy CEO Nguyen Manh Hung said the carrier would complete the deal with AVG, the owner of An Vien Pay TV network, within three to six months and added that the two sides would cooperate for a year on the basis of maximizing resources to create a new product for the TV market and mobile telecommunications. He did not reveal the value of the deal. 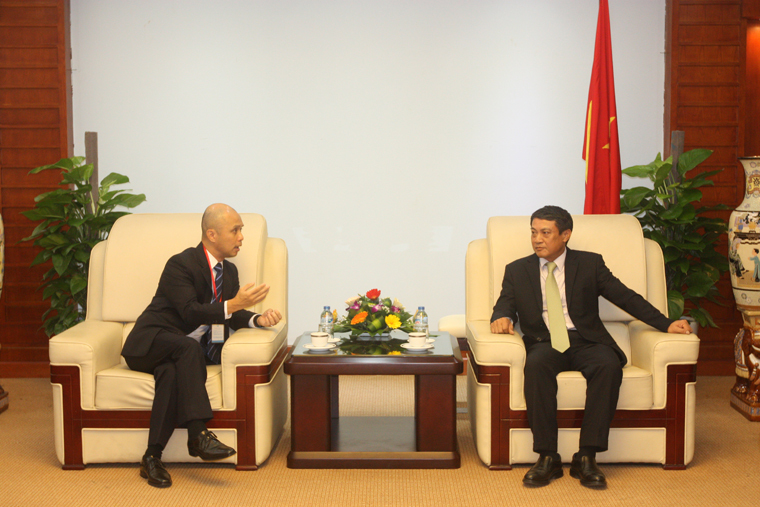 In 2014 the Vietnam Posts and Telecommunications (VNPT) officially transferred ownership of MobiFone to MIC. The ministry has said it would be equitized before the expected time of July 2016 but it is still to be completed. MobiFone is now a one member limited liability company, with the State holding 100 per cent of its charter capital of over $703 million. Revenue in 2015 reached VND36.9 trillion ($1.66 billion), for year-on-year growth of 8.29 per cent, while profits rose 1.1 per cent, to VND7.4 trillion ($333 million).